The company will provide up to 100 groups with a free group travel return journey for up to 50 people over the course of the year. 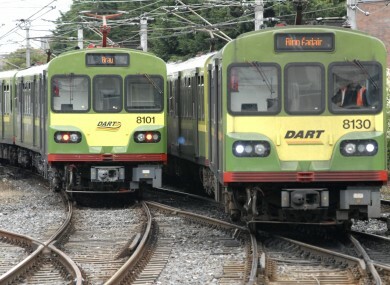 IARNRÓD ÉIREANN has today launched the 2013 programme for its initiative offering free trips to community groups and charities over the course of the year. The ‘Journey’s on Us’ initiative will provide up to 100 groups in the voluntary, community, sporting and charity sector with a free group travel return journey for up to 50 people per group. This will add up to around 5,000 free journeys on offer over the course of the year across any of the company’s services. The company said that the travel facilities will be “ideal in particular for organisations bringing a group to a special event, or as part of a specific support to the members of the group which requires travel”. Commenting at the launch today, Chief Executive David Franks said that voluntary organisations are the “life blood of communities across the country”. However, like everyone, their budgets have been cut. We know there are youth, sports, music, voluntary, charity and other groups in the community who would benefit greatly from being able to undertake initiatives which involve a travel cost, but have had to scale back. We in Iarnród Éireann, through ‘The Journey’s on Us’, want to do what we can to help such groups achieve their goals, and say thank you to the organisations which play such a vital role in the daily lives of communities. Today the company invited all of these groups to apply for one of the 100 trips available. Entry forms are available at all Iarnród Éireann stations or online. Entry forms can be filled out online, emailed to journeys@irishrail.ie or by post to Corporate Communications, Iarnród Éireann, Connolly Station, Dublin 1. The closing date for receipt of entries is Friday 3 May, at 5pm. Last year, over 700 groups applied for the scheme, and organisations ranging from Men’s Sheds to choirs, Special Olympics to Girl Guides, and groups representing youth and elderly, benefited from ‘The Journey’s on us’. Email “Iarnród Éireann offers free trips to community groups and charities”. Feedback on “Iarnród Éireann offers free trips to community groups and charities”.